A lone image (low-resolution only) surfaced on Reddit showing what’s claimed to be a spontaneous fire involving a Tesla Model S.
From the image, it does not appear as though the car was involved in a collision and, in fact, the telling of the occurrence doesn’t include any mention of a collision, aside from “heard a loud noise,” which could be impact related. Nobody was harmed in the fire. Tesla is aware of the incident and is working with local authorities to establish the cause of the blaze. We’ll update this story if additional details become available. 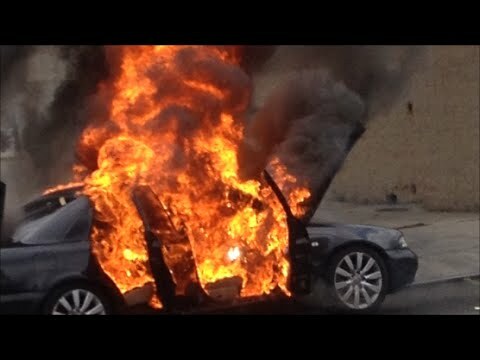 146 Comments on "Tesla Model S Catches Fire During Test Drive In France"
No, a gasoline fueled supercar fire would have been far more likely to have killed someone. There are “THOUSANDS” of Gasoline car fires daily that we never hear about , That’s old hat ! But soon as an EV catches fire , you never hear the end of it! I agree. Why are some people so anti EV? I drive a MiEV, and have been verbally asaulted at a red light. Minding my own business… what the neck is wrong with those people? Someone driving an EV is doing good for EVERYONE. Supplying them is doing great for everyone. Three cheers for Tessa motors. I hope they continue to do great!!!! First, there are not 1000s of car fires per day. The best number I could find is 17/hour or about408/day on the NFPA site. Of course that is still a large number. To compare the ICE number to the EV number you of course need to normalize to the installed base and this is where things get alarming for EVs, and why they are always covered in the news – how many millions of cars are there on the road and how many thousands of EVs? I think it is much better than a gasoline car because it gave the occupant a chance to leave the car. The computer gave them plenty of time to do so. This is a big advantage. There is no way a gasoline car can do that. This car will self destruct in 60 seconds ! Obviously it was the driver. Tesla logs will prove this. OK, enough sarcasm for the morning. Glad everyone is OK.
For all you internet sleuths out there, what’s that black line to the left and right of the Tesla flambé? After all these years of being consistsntly wrong, one would assume he’d realize the futility of his efforts… Guess not. I actually like Tesla, but hate Tesla fanboi worship, zealotry, and hyperbole. Some of my best friends are Teslas! Agreed. A Tesla fanboi’s hurt feelings is JUST like 200 years of institutionalized discrimination. You’re right: the comparison you suggested would be ridiculous. Yes, that’s exactly what sven’s comment reads like. The kind of statement that is always followed by a prejudiced attack. In this case not racist, but FUDdite. I understand what you mean – (for a non-US person) it’s a bit like listening to the crowd at a successful SpaceX launch chanting ‘USA, USA…’. But, like SpaceX, given what it has achieved in such a short time, I think Tesla really does deserve a good deal of that hyperbole and worship, don’t you? Driving over a downed power line being the cause of the fire sounds plausible, but doesn’t fit the narrative. “We heard a loud noise, then the car gave a ‘Problems with charging’ message while we were driving, so we pulled over” doesn’t fit with stopping directly over a downed power line. Not unless the car was going so slow that its speed could properly be expressed in inches per minute! I’d be interested in the stats for cars within the first year of ownership. Just about every Chrysler product from the late ’90s to the early ’00s had defective headlight switches that would melt. I had an ’01 Sebring Convertible that the magic smoke escaped from the switch about a week after I got it. I have an old Taurus SHO that has two spots that are notorious for burning cars to the ground: a connection below the master cylinder and the connector for the ignition switch. I have replaced the ignition switch connector twice in the 15 year I have owned it because it melted. I was driving the company van, it probably had 500k miles on it. Smoke was coming from the vents. I pulled over and called base. Two vulnerable adults on board. Me: Smoke coming from vents. Base: Let us know if it gets worse. It did later, when the plastic around the wires melted and caught on fire. Turns out they Jerry-rigged some under gauge wire to keep the lights on all the time, for safety. After putting out the fire, with passengers away from the van, I called base. Damn, ffbj, you are fire today! Nice story with the ‘for safety reasons’ and ‘It got worse’. Thanks. Yep, after all the fb stands for fireball. Fred “Fireball” Jackson. The npc mage that was added to the party, as a matter of course. Your statement that “This fireball in front is much larger than the typical ICE fire.” leads me to know that you are not the most “fair and balanced” commenter here…. What make and model EV do you own? BMW i3 and a Tesla Model S. I have also owned a Nissan Leaf. Ok thank you, very good. You have at least put your money where your mouth is. You have experience with EV’s and have bothered to sacrifice $$$ to drive them. To be fair, that does look quite severe after only 1 minute. It will take less than a second for a gasoline tank to make a much bigger fire. But not if the car caught fire due to an electrical fault ? This is most probably a purposly destructive run test. I didn’t expect such a large fire ball relative to the size of the battery. If it doesn’t explode, at least somehow, than it probably isn’t any fun inside a car. My motto, anyway. That pouch cell already looked Balooned / Puffed. That leads me to believe there was already an issue with the cell. No mention of the cell chemistry either. No explanation on what they did to cause the fire. There are two different colored wires, do they go to a shorting switch or to a charger? If a charger then the battery was severely over charged. If shorted then in a normal installation there would be a fuse to prevent this. You can tell the same probably about all electrical fires – short circuit. The only small issue is to find where exactly it shorted. Actually a short circuit is much safer since the overcurrent device in the distribution panel will open (whether a circuit breaker or fuse). The Tesla fire in the garage that was described here, as well as the 2 ford fires basically boil down to 2 poor overheating connections that slowly started a fire over time. Food for thought: Do you have smoke alarm above your electric charger & car in the garage? It can make difference between smoked or burned garage and burned house, maybe with people inside who never got chance to wake up after breathing carbon monoxide. I would not attempt to extinguish such fire or get close to it if the battery itself caught it. Not every extinguisher will be efficient or safe and toxic fumes may have long term health effects. The report is that they pulled over and then the car was on fire 1 minute later. The pictures are not necessarily 1 minute later. It’s ironic when a non-owner Tesla fanboi flames a former Tesla owner in a Tesla fire thread for not being “fair and balanced”. LOL! who is the non Tesla owner? And altho Bill is a former owner of a Tesla Roadster, it’s quite clear he has an axe to grind against Tesla, as his posts frequently indicate. Not saying what he reports is untrue, but he certainly feels the need to repeat it pretty often. Bill is disappointed in the quality of Tesla given his personal experience with them. I don’t see how that opinion is an “axe to grind” more than factual testimony from a first party. Certainly a lot more credible and worth reading than the people that spread FUD about “the-company-making-a-plug-in-that-is-not-their-favorite-plug-in” whether that be Tesla, GM, Leaf, etc. …or at least I presume he is disappointed. Not trying to put words in his mouth. Usually after a decade or so, I personally don’t spend every day on websites grinding my axe against a company I had a problem with a product that they don’t even make anymore. Tesla hasn’t made a brand new Roadster for half a decade, so any problems somebody had with the Roadster doesn’t have anything to do with what Tesla builds today. There is a point in time where normal people stop beating a dead horse, day in/day out, day after day. At a certain point enough is enough already. Time for them to get over it and move on with life. Nix, it is you that has the ‘axe to grind’. My comment on this article was comparing the S to the very well designed, fireproof battery in the Roadster I used to own. Indeed, I don’t recall any overheating or fires of the battery assembly ever in ANYONE’s roadster. Most people would take that as a complement. Instead of trying to figure out what happened to this demonstrator car in France, you magpies always try to turn this into a clash of personalities. That is why the comment from the fire investigator is instructive. Namely it stopped 50 more pointless drivel comments from you guys. When I was painted unfairly here, AT THAT TIME in the comments, I detailed the sequence of actions that finally made me decide against a model S, at that time. 2). Mad at Musk cuz we want to date his girlfriend. 3). Paid by the oil companies. 4). Work for the Koch brothers. Bill — It is not my fault that you are blind to your own repeated bias, story after story. My comment wasn’t limited to this one post, or this one story. Seriously, you need to get over it. You got a Roadster built on technology which is now a decade old. You weren’t happy with that decade old technology. We get it. You can’t keep on pretending that your former Tesla ownership of technology Tesla built a decade ago somehow gives you some sort of insight into what Tesla is doing today. Your continued harassment of anybody who you don’t think has the right prior EV ownership credentials is silly and offensive. As if your ownership of a Roadster from Tesla’s ancient history of buying Lotus gliders and retrofitting another company’s drivetrain, have ANYTHING AT ALL to do with what Tesla is currently building. You are wrong. You don’t get to attack other people for their EV ownership, while pretending that your own Roadster ownership somehow makes you an authority on what Tesla is currently building. It doesn’t. Ever hear of “Reading for Comprehension”? Maybe those words are too long. My initial comment only complemented the Roadster on its Robust, fire-free battery. Absolutely none of you Gasbags gleened that point. You and your ilk are constantly trying to pick fights, and it really degrades this website. Although theoretically NON-EV purchasers are welcome to comment, the sad fact is many of the non-ev purchases here are just trouble-makers and contribute no new information, or if they accidentally do say something on topic, its rehashed stuff from Wikipedia, which isn’t really a source. I’m a source author for Wikipedia, if you disagree with the previous statement. Well, that is not true – I do have experience with the S on the points I have commented on, and also listen to other owner’s experiences with the S, and also the advice of Tesla Service people. People’s advice who is far more valuable than yours. I have personally seen Tesla plugs overheating, and my knowledge of gearboxes and the 3 classes of loading they are subjected to made me wince when I first saw a Model S cutaway in the Toronto Salon, and overheating at the Tesla Missassauga Service Centre. I predicted problems with both due to my understanding of current density and permissibile loading classes as mentioned. But “The fool learns ONLY by experience”. “A wise person will listen and take in more instruction. But he who is having dealings with the stupid ones, will fare badly”. I’ve given plenty of information in my responses, and its falling on deaf ears. You will no doubt give a page length response to this since you no doubt have to have the last word. My intention was only to comment on this fire, it was not to constantly engage creeps. Just so there is no misunderstanding, I more than welcome a NON-ev owner who has a mature thought, or someone who has an intelligent comment to make. I fear all the intelligent comments on this article already have been made, so I’ll wait for the next article. Run along now Sonny, I’ve heard this literally 5 times before; – time to pick on someone else, as my ‘creep limit’ is one sentence. Yet another ineffective insult on top of a string of completely ineffective insults and equally ineffective dodges. Do you have Personal Ownership Experience with the Model S? This can be answered with a very simply one word yes or no answer (free of insults), if care to be intellectually honest. What firsthand knowledge do you have regarding those comments? Its true I don’t know you. Unless you’re playing dumb on purpose you ain’t that bright – no offense. I know because the fire inspector here said ICE fires contained to the engine compartment are usually smaller. Plus my eyes work. The chinese Info was from Crain Communications, Inc.
“Blow up in your face to an extent that you’ll never know.”. Uh, people have such interesting dreams… But your hand must be getting tired by now. Most ICE cars so not contain so much aluminum. Are you saying the car exploded? How would you know that? Bill is definately a “Glass Half Full” commenter, with a touch of Early Adopter Regret. True. Though he is very knowledgeable. Yes, the lemon roadster saga. Even a li-ion battery fire in a laptop burns hot and intense; airline stewardesses are given special instructions on how to put them out. A Tesla battery pack is, obviously, much larger so has a lot more to burn. But do you really think a fire involving a gasmobile’s gas tank wouldn’t burn down the garage the gasmobile was parked in? Our garage once burned down because my dad burned some leaves in a trailer, and didn’t quite get the fire extinguished before he pushed the trailer back into the garage. Doesn’t take that big a fire to spread in the interior of a wooden frame structure. Car fires that remain confined to the engine compartment are usually smaller. It is the fuels found within the passenger compartment or fuel system that really get them cooking. The size of the flames in the Tesla photo are consistent with the front and side glass being compromised providing oxygen to aid free-burning combustion of the passenger compartment fuels. The thick black smoke is typical of burning plastics (carpeting, dash, seat foam, head liner, moldings… etc) that you get in any modern car fire. A tanker truck containing flammables, plus four additional vehicles caught in that particular wreck, is going to produce some pretty spectacular energy release. I posted a photo, along with my personal experience, to comment upon Mr. Howland’s surprise at the size of the flames. My goal was to explain that the energy (fuel-load) contained within the passenger compartment of most modern vehicles is sufficient to produce flames of that size, regardless of the motive energy storage used (gas/diesel/electric/etc…). Simply is that you never/could carry so much energy with battery whatever means you choose. Thus, damage is magnitude less with energy store in battery. Carrying less energy in a narrow area/container is a safe practice. Hope it’s much clearer now. I was about to post that picture, of that spectacular and recent accident in Montreal where a diesel truck took in fire in a few seconds. The driver was conscient and burned alive, but nearly nobody said that diesel was dangerous. A year ago, I also saw a similar accident involving a tanker and a family of 4 that burned under it. It was such a small news, only really local newspapers talked about it. So why even talking about only one car taking in fire? If you don’t care for a ICE car, you shouldn’t care more for an electric car, which is still a car. How many ICE cars you have burned down and measured the size of the fireball? I’m surprised that picture was taken 1 minute after they exited the car. Somewhat hard to believe really. Meanwhile, TSLA is currently up 1.5% so this is clearly not the issue it was in 2013. People know now that Teslas are much safer than other makes. These days when everyone has a phone you would expect a series of photos or even a video. Can’t remember off the top of my head but did the Nissan Leaf have many incidents of fire with their batteries ? It’s the fault of the guy on the right. always appreciative of the music references for entertainment. The song “you better run” comes to mind. That’s what you get for using a lithium powered cell phone, kids. Thanks Eric Loveday. Interesting that a Tesla employee was in the car. I wonder which model S this is. Refreshed? Most of the demo car are new so probably the refreshed Model S.
My wild guess is there was a battery coolant leak that allowed a bad cell to heat adjacent cells. I wonder if a better photo shows coolant on the road leading to the parked location. Or maybe a puddle at the SC. Only detonation would be supersonic. I think you mean deflagration which is subsonic, as in the case of an ICE fire. If there was a loud sound and they didn’t run over anything, it could be an indication of a short or a large electrolytic capacitor biting the dust.? He was elsewhere at the time.? 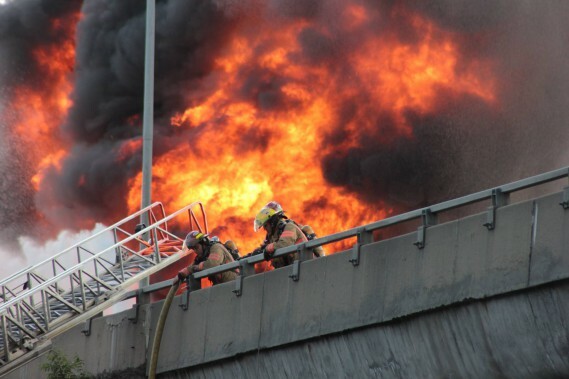 164,000 car fires, and 300 related deaths, in 2013… in the U.S. only! One Tesla car fire internationally in 2016, and no fire-related deaths ever. Which gets reported as news? All the attention Tesla gets from the media is a two-edged sword. Gotta take the bad with the good. While I do agree, generally, I’m not sure how many brand new ICE cars spontaneously combust during test drives. I’d consider such an event newsworthy. It’s unfortunate, but it happens on new cars, mostly when they are just a few weeks old. After a service visit is another common occurance. Forgetting to clamp a single hose can be quite disastrous. If some oil leaks onto the engine block, you’re screwed. If petrol leaks and reaches flashover it shoots a nice fireball, and you’re screwed. If you are lucky you spring a cooling hose and it’s just the engine that gets screwed. I just googled “new [mercedes/bmw/audi] fire” and found these three in a few minutes. Unfortunately I think new car fires are more common (and deadly) than any of us would like. Let me clarify, I don’t have anything against those automakers. They are just the closest ICE competitors to Tesla today. I’m not disagreeing with what you are saying but it would be interesting to know what kind of % of fires per ICE compared to the number of Tesla car fires ? It is slightly worrying that people (including myself) have EV’s parked in our garages and that’s before I also put ES in to go with the PV system. It may be really useful to check if something is too warm, but really it is not adequate. You need specifically ask for thermovision inspection from electrician, not every electrician has equipment or bothers to use it. You need smoke detector that is able to wake you up reliably when you are in bedroom. Thick, black smoke indicates a very hot fire. I wonder what caused this to happen so quickly. Due to the nature of the fuels within the passenger compartment (plastics) and the use of plastics throughout modern vehicles, thick black (highly toxic) smoke is the norm. I too am very curious to learn what caused this incident. No, it just indicates a lot of carbon/soot in the smoke. The amount depends on what is burning, and isn’t directly related to how hot the fire is. For example, burning tires produces a great deal of black smoke, but such a fire doesn’t burn particularly hot. Now, a lithium fire does burn very hot… but that’s not why a burning BEV produces a lot of smoke. I think the black smoke is mostly due to the plastics, fabric, and padding inside the passenger cabin. Can somebody tell me why is this relevant? It will be a time that flat tires will be news. Unusual for a car to catch fire without a collision. Especially when the car is expensive. The pics of people bailing from their Ferrari were very popular. Plus Tesla has been in the news for failures recently. It’s relevant, I do want to know if this could happen in my garage. Did you ask the same for the thousands ICE that cough fire every year in order to avoid one in your garage? I traded in my last gas car in May, so only interested in EV aspect of it at this point. Most people don’t refuel their gas cars in attached garage every night. Some do maybe, and they really need to watch videos about gas and gas cars catching fire more. And when you charge battery, it is a bit higher risk activity than leaving whatever car off and doing nothing with it. Not a big deal when you follow safety precautions, but you need to follow them. Yes, it could. It’s extremely unlikely but anything is possible. Michael — If you store energy, it always has a chance of unintended rapid release with destructive consequences. Yes, it can happen to you, no matter how you store the energy. If you have a gas car, the gas can catch on fire. If you have an electric vehicle, the battery can catch on fire. If you have a horse, the energy in the hay you use as energy to feed the horse can catch on fire and burn your barn down. If you get your energy in the form of hydroelectric power from a dam, the dam can burst upstream of you and flood your house. There is no 100% safe way to store and use stored energy. I’ve put in my reservation for a new Tesla. I’ve got a 50A circuit installed in my garage. The only other items on my checklist for when my EV arrives is (1) install an EVSE and (2) add a smoke detector in my garage on the ceiling between the gasmobile and the EV. They dropped out the most important part of the story . . . I wonder what the “Fire Sale” pricing was? Oh, hi and thanks ffbj. So what’s that long black line coming from the forest across the street the car is on/over? It looks like a high voltage power line and it also looks like it is on fire as well. Look at the shadows in the picture. Probably just a pole or the trunk of a tall tree. Seconds thoughts, maybe it’s a paved path or a run of some pipe across the road. Nothing that’d be relevant. In 5 years these isolated incidents will be seen as insignificant. Just errors that happen with every new technology. Maybe the driver drove over a large rock. Happened to my ICE once, oil pan get destroyed and the fossil engine lost all its oil. whereas in the real world…. Yes, that is very inconsistent with other reports of BEV fires, including the few Tesla car fires. In previous reports, it has been said the fire took several minutes, after passengers safely exited, to grow to the point that flames were shooting out of the car. Still, not impossible. The loud “bang!” the passengers heard may indicate something very unusual happening underneath the car, and possibly inside the battery compartment. That black line sure looks suspiciously placed. It’s quite clear we don’t have enough information. Speed at time of fault, possibility of impact from below, etc. Can we blame ISIS? It could have been an IED. No, we can’t blame ISIS. We can instead note that they stopped and parked _after_ a warning, so that black line is just a coincidence, and then wait for the results of the investigation. Quite unfortunate. Doesn’t seem as if anyone was injured. That’s the most important thing. No doubt Tesla will claim driver error and/or a failure to read the owners manual before the test drive. Or perhaps it will wait to get more details before explaining why it is in no way, shape, or form responsible. Will be interesting if it was in autopilot and Tesla HAL was responsible. I guess you can’t handle the truth. The undeniable fact is that Telsa ALWAYS claims it bears no responsibility whatsoever and that someone else is at fault. Treat autopilot as autopilot — hey, even though we demonstrated using autopilot this way, we told you on page 89 of the manual not to do this. If you can’t recognize the obvious pattern it’s only because you don’t want to recognize it. At this point I have no idea what happened or if anything of note happened. I do know, however, that regardless of what happened Tesla will deny any responsibility. It may be the employee or the prospective customer or the road or cosmic rays, but it won’t be the car or Tesla. Oh please! Spare us the hyperbolic nonsense! If this was a car issue, Tesla will own up, just like they did on the car charging fire a while back. Your attempts to conflate improper Autopilot functions use, to what may be an electrical malfunction, is disingenuous at best! If the the car bit the dust from a malfunction, Tesla’s going to relay what information they have. No differently than they’ve done before.? Packing that many false assertions into a single sentence is an impressive achievement! I suggest we wait till this incident is confirmed at least from another source (or Better yet by Tesla) before spending all this energy hypothesizing. Hats not a Tesla! That’s a Honda Civic burning! That thick black line looks like railroad tracks to me. My ICE Camry with 215,000 miles on the odometer and 100% demonstrated reliability is laughing. Can you hear it? Tesla is using an especially volatile battery chemistry. You don’t see other electric cars lighting off like this. I would not use their batteries on an electric bike. Russ, are you saying that the model S batteries are too delicate, that is, too sensitive to physical shock? Or are you saying that an overcurrent happened which ‘avalanched’, and was not isolated to the string, as for instance it would have been in my Roadster. Since a ‘bang’ was heard, was this just an errant capacitor ‘blowing’ as one commenter stated or were you thinking of something else? Mr Finley: Congratulations on completion of your latest electric bicycle – many of us would be interested in a few details of it if you’d care to share them. I gather you used a different type of battery than Tesla uses.. Question: Is there a battery cell with roughly the equivalent energy capacity and low price as the Panasonics that you feel is sufficiently less-volatile, or has a tendency to isolate itself better from trauma? As far as “Carbon Released” is concerned, here we must agree to disagree. For one, carbon isn’t released, but Carbon Dioxide is. Its more silly than calling water “Hydrogen”, obviously it would be more correct to call it “Oxygen”, in fact both are incorrect. Carbon Dioxide is one of the building blocks of life, If you’ve ever seen a hot-house in operation. The Nuclear Industry lately has been losing its battles – at least in the west. Because everyone ignores daily ‘Routine Releases’, and since I don’t ignore them, I cannot consider it a clean source. But tell us about your bike and battery choices.